The Tetro cDNA Synthesis Kit contains our highly sensitive MMLV reverse transcriptase, oligo (dT)18 and random hexamer primers and all the necessary components to generate high quality cDNA from RNA templates (fig. 1). 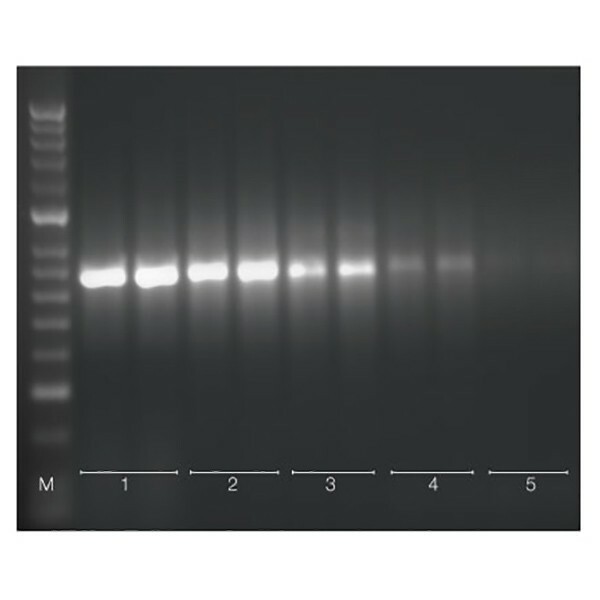 The first-strand cDNA generated is ideal for PCR (fig. 2) and can be used in a variety of other applications, such as analyses of cellular RNAs, characterization of RNA splice variants and the generation and cloning of cDNA. The Tetro cDNA Synthesis Kit is optimized for RT reactions over a wide range of total RNA concentrations (10 pg-2 μg), such that long and low-abundance cDNAs can be detected by amplification after cDNA synthesis. The kit contains oligo (dT)18 and random hexamer primers. The kit components are fully optimized to generate maximum yields of full-length cDNA.